Angiogenesis is the process by which new blood vessels are generated from preexisting vessels. It is vital for proper embryonic development, patterning of the vascular system, and wound healing. It is rate limiting in cancer progression, because the formation of new blood vessels is essential for growth and survival of tumors. Written and edited by experts in the field, this collection from Cold Spring Harbor Perspectives in Medicine reviews the mechanisms of angiogenesis that operate in normal development and in diseases such as cancer. The contributors review the biology of endothelial cells, describing the specific roles of tip and stalk cells in vessel sprouting and lumen formation. They discuss the key angiogenic regulators (e.g., vascular endothelial growth factor [VEGF]), as well as antiangiogenic agents including microRNAs, thrombospondins, and semaphorins. Therapeutic approaches that target pathological angiogenesis, such as the ongoing clinical trials of anti-VEGF drugs, are also covered. 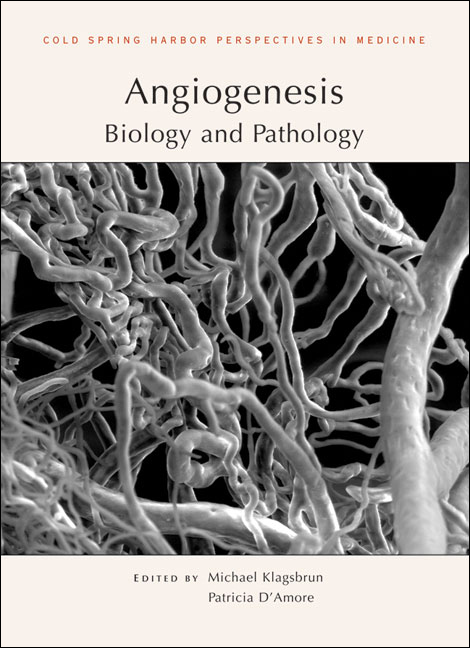 This volume, which includes discussions of other vascular dysfunctions (e.g., arteriovenous malformations) and comparisons between the blood vascular system and the lymphatic system, is a vital reference for developmental and cancer biologists, as well as anyone seeking to understand the biology and pathology of the vascular system.